The antibiotics did not trigger a “code blue” and are now waging war with the e.coli in my system. The last cephalosporin I took was quite an event culminating with a team of 12 reviving me. My doc is not concerned about the e.coli. He says it will clear. The “issues” that concern him are my two liver bile ducts. My CT scan shows that they are narrowing for some reason and backed up bile is not a good thing. A lot of times this issue resolves on its own. Other times docs have to “go in there” and fix them. I don’t like the sound of “go in there” so I’m praying it resolves with nudging from the Lord. He can nudge them to widen. I never expected what has happened since May 2011 with this journey blog. Today, it has more than 5000 readers. Many of them have been struggling with faith issues, chronic illness, or finances. Some readers have received transplants while others are hanging on waiting for a donor – livers, lungs, kidneys, hearts … Some have friends and loved ones going through hard times. Others are people I have direct and indirect connections with. I really appreciate all of the emails and messages that come. I pray that I can encourage you never to give up. Those of you who have put your faith in Jesus as you’ve read along, I hope you will keep in touch and we’ll keep growing. And those who feel your faith rekindling through sensing the depth of grace, I hope you’ll let nothing stomp out that flame. The weird thing? This blog has resulted in a much larger “church” than I have ever served. I’ve met so many people and had so many conversations. In May 2011, I heard God speak within me and tell me to write honestly. Now, this virtual church of sorts makes me understand why. All of you bless me much more than you will ever know. I love your emails – positive, negative, questioning, celebrating, mourning, up, down or whatever. Community and sharing life is vital to our growing. This entry was posted in chronic illness, Liver disease, organ donation, Organ transplant, pain. Bookmark the permalink. Glad to hear you are doing better. Hope the ducts take care of them selves…you sure should n’t have to go through anymore. I’ve been following your blog for quite some time – can’t even remember how I came to it. I’ve been praying for you the whole while. 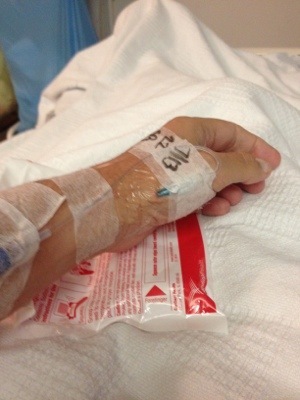 I have had an IV in that spot – you are quite correct that it is not the best place for one. Didn’t you at one point say that you wanted to reach people that wouldn’t step into a regular church? Aren’t you doing that through this blog? You are reaching people where they are at. Those that are waiting for transplants, who better to tell them about God than someone who has been there, and understands better than others what they are going through? You are a very gifted writer and communicator. God can use you in ways you probably have never dreamed of, even if it looks different than what you originally thought. It is so exciting to see God work in your life. And you are an encouragement to people, whether they are going through something difficult or not. I don’t know God’s plan, but I just think that there are exciting days ahead for you. What is a church? A group of people that meet together and have a leader. You have 5000 people that meet together regularly to hear what you have to say. You are leading us through life in a sense. Keep talking. There are a lot of people listening. AMEN to that Mary!!! Scott keep up the good work my friend. Your ministry is expanding. I really don’t think God cares how we get the message, of course person to person might be best, but it is important that we get the message. And Christ’s love and care of you has a wonderful message both to you yourself as those of us out there in the internet world. God Bless!